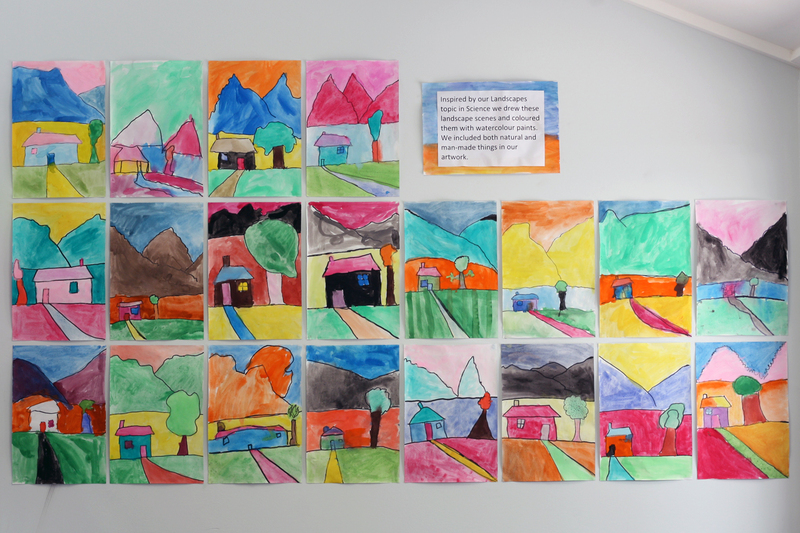 Year one made these vertical landscapes in three steps. Initially I led a guided drawing lesson in pencil. Next, the students traced their "good" lines with black markers and did a little erasing. 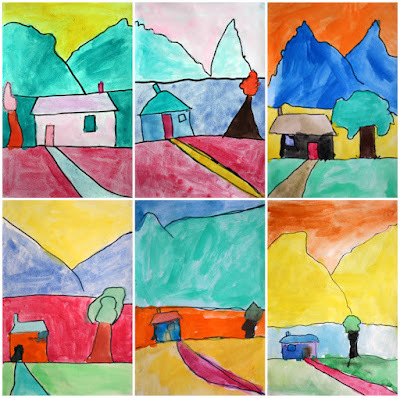 Finally they coloured them any way they chose with watercolour paint. 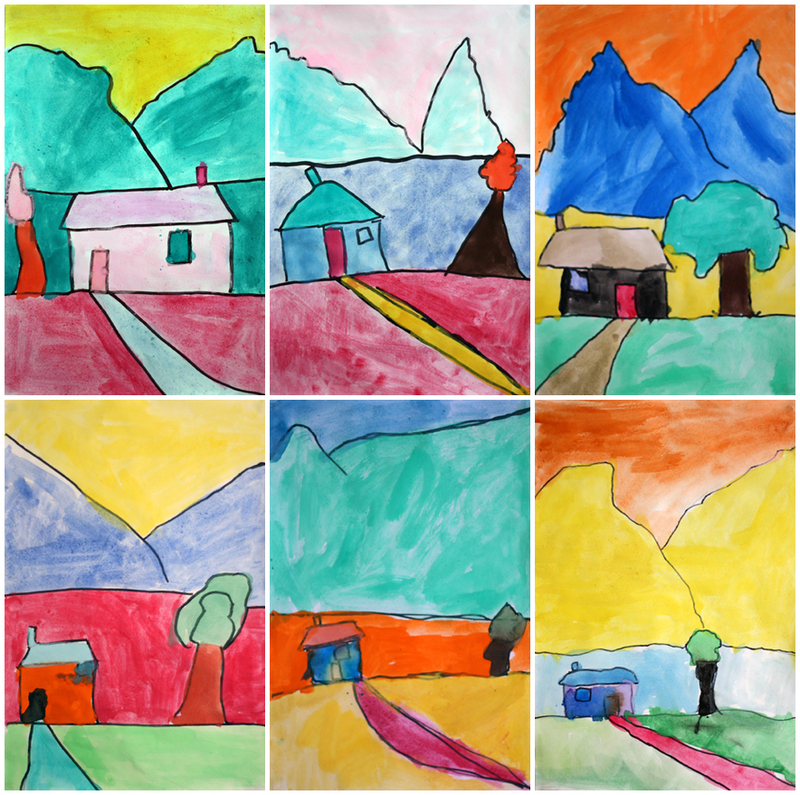 We had just completed a science unit of work about landscapes, and it seemed only appropriate to attempt this classic art form. I took inspiration from one of Kathy Barbro's many fine lessons on Art Projects For Kids. For any eagle eyes out there, please ignore the missing comma on the class display text! These are really beautiful, and minimal in the best way. Something about them reminds me of Gauguin's work - maybe the colorful mountain backdrop. These are wonderful. Nice job. Beautiful! I love it! Also the fact that it's vertical... it's different! 1) how did you introduce the project? Did you show them examples of artist's paintings, if so, which ones? 2) What size and type paper? 3) Could this be done in one lesson, or did you use two days? 4) Were these pan watercolors or liquid? I drew an example in the lunch break, we had a look at this and then I lead the guided drawing lesson. The paper was around A3 in size. And we used pan watercolours.